Today we’re going to discuss the key principles of exercise for bone health. We will also cover what makes up a comprehensive osteoporosis exercise program and what is involved in a bone health assessment. 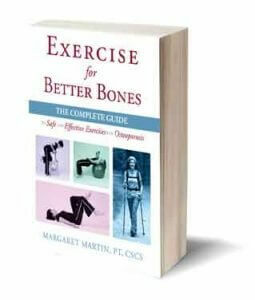 Exercise for bone health is very different than other prescribed exercise programs. A exercise program for bone health needs to incorporate several key principles. Lets review them one at a time. The number of repetitions represents how many times that individual can lift the weight consecutively. When a client indicates that they do 12 to 15 repetitions per set but could do 20 repetitions, that, unfortunately is not intense enough. The research clearly states that the amount of weight isn’t so important as to how intense that weight feels when you’re lifting the weight. If you’re doing an exercise and you can actually do more than 12 repetitions with the weight or with the amount of body weight that you’ve put onto the exercise, then it’s too easy for building bone. Bone need stimulus and exercise needs to be intense to create that stimulus. One more thing on exercise intensity. We know that high mechanical strains are very good for the bones and that high loads with sets of 8-12 repetitions in the 70-90% 1 rep max range has been shown to be very good for bone. Having said that, I would never start somebody who has been de-conditioned for months or years on that mechanical strain load. You want to start with lower loads, higher repetitions, gradually building into the load that we know helps to build bone health. We also know that running and jumping induce great ground reaction forces so much so, somewhere in the order of three to six times your body weight, but it doesn’t mean that everybody is ready for it. We want to load the body in a safe and progressive manner. Secondly, in order to work as many bones as possible, you need to work as many muscles as possible. You really want to target the muscles around the hip and the back because that’s where we have a lot of cancellous bone. We need to stimulate the bone to keep it strong. The effects of exercise are site specific. This means that exercises for the upper body will not impact the bone strength of the lower body — and vice versa. We know that mechanical loading is good. Loads that contribute to bone building are things like gravitational forces, muscle forces, and ground reaction forces. In each case you need to find the right forces to keep your bones healthy and safe from fracture. We also know through numerous studies that weight bearing is far more effective at building bone than non-weight bearing. Weight bearing exercises are essential for bone health. What do I mean by that? A weight bearing exercise is any exercise or activity when your skeleton experiences a “load” from your body weight (or when you use a weighted vest where you’re actually making yourself heavier). When you jump and land on your feet and you feel that pounding, that’s a weight-bearing exercise. Swimming, elliptical machines, and cycling are considered non-weight-bearing or lightly weight-bearing because they’re not loading enough to build your bone. If you like doing them, fine. But you need to incorporate some weight bearing exercises into your program in order to ensure that you’re stimulating your bone — because as I mentioned earlier, weight bearing exercises are essential for bone health. Your bones like to be kept on their toes so you need to vary your workouts and incorporate novel movements, activities and exercises. You want to have novel patterns — meaning doing different things as much as possible. It is great if you love to do squat. But challenge yourself with hitting a few of the stair cases on route to your exercise and going up and down stairs, or doing crossover steps, or taking up a dance class so that you are introducing different patterns of loading on your bone. These are all great ways to load your bone. When it comes to weight training there are hundreds of ways to stimulate the biceps or thigh muscles. However, you want to make sure that you’re doing it in such a way that is safe for you. The following are key features you should be looking for in a comprehensive exercise program. Exercise for Better Bones incorporates each of these and customizes the program to your activity and fracture risk level. First and foremost, that it incorporates postural exercises. This is especially important if your own posture is not 100% where it should be. Having good posture and using your own head as your primary weight-bearing exercise is very important. You want to ensure that your head is resting well over your shoulders and over your hips so that you’re not letting your head drop forward. So if you don’t have perfect posture, you want to ensure that a comprehensive exercise program for you incorporates some postural exercises. Strength exercises need to be intense and should be very varied. Balance is quite important especially for individuals living in Northern climates because of the ice and the snow. Having good balance will help ensure that you don’t sustain a fall. Having a fall is usually one of the key reasons people actually fracture. I have placed flexibility in here because doing flexibility exercises with good form is important and having the flexibility to move well with good body mechanics is also very important. So flexibility exercises on their own do not help you build bone, but they do help you to move safely. Indirectly, they’re protecting you from fractures. Lastly, and very important, cardiovascular exercise. Not only do you want to be building bone and doing cardiovascular excises in a weight-bearing format, but you want to be doing lots of different exercises. 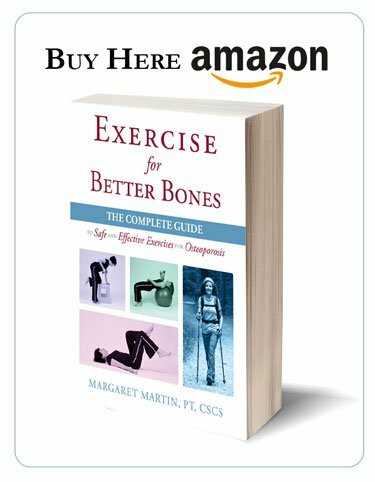 Exercise for Better Bones offers suggestions for every level of fracture risk. What are the determinants of bone health that ensure that you know your bones are staying healthy and they’re remodelling at a healthy rate. There are quite a few determinants of that. You have no control over is your genetics but your biological parents and their genes are a large determinant in the health of your bones. Unfortunately, there is nothing you can do about that at this stage in life. Your nutritional intake and your alcohol intake are major factors. Whether you have food sensitivities, allergies, all of that will affect your ability to absorb nutrients. Your activity and exercise is very much a determinant of bone health. Hhormones play a very big role in the determinant of bone health and this is especially seen in the amount of bone growth, the years surrounding puberty. During the two to three years surrounding puberty, girls and boys will build approximately 26% of their entire bone mass that they will have in their adult life. The combination of the hormones (and if they have an optimal level of activity and nutrition during those time) that can really set them off for a good start in life in so far as their bone health. The last determinant of bone health is medication and well-being. Cancer treatment-induced bone loss is the known term for the bone loss that occurs because of the treatments that are currently used for cancer. Chemotherapy, we know, causes reduced bone mass. Tamoxifen in premenopausal women increases fracture risk by 32% after five years. In post menopausal women, Tamoxifen actually has protective effect on bone. Cancer treatment induced bone loss is most commonly seen in patients with breast and prostate cancer who received the chemotherapy, hormone therapy, or surgical castration. Low bone mass is found in patients with lymphoma treated with corticosteroids, radiation or alkylating agents. How do we know the state of our bone health? We need a bone health assessment. A bone health assessment includes a number of key components. Let’s start with bone density and then discuss bone quality. Unfortunately, right now the only tool that we have measures bone density and not bone quality. Bone density is measured with a DEXA — a bone mineral density test. Bone density is in read in grams of bones per cm2. Your T-score and your Z-score are two numbers that you will often received. Your T-score quantifies the difference between your bone mineral density at your current age and the peak bone mass for a young healthy person. So you’re being compared to a young female at their peak — roughly about 25 years old. The Z-score quantifies you between your bone marrow density at your current age and the peak bone mass of your peers. Bone density is just one part of the bone health assessment equation. Bone quality is the second. Bone quality is the ability of your bones to resist the fracture. We know that some people with good bone density might have poor bone quality and therefore still fracture. What type of mineral matrix deposits have developed? What kind of collagen for bone health? What have the bones been exposed to through exercise, through movement and through impact? Those are the things that will alter the quality of the bone. So one of the consequences of poor bone quality? Well, one is obvious and that’s fractures. Not all fractures lead to pain but they do certainly lead to limited movement and reduce quality of life. Where are the most common fractures sites? The areas in our bodies that have more trabecular bone will be more impacted. For most of us these ares include the spine, our wrists, and our hips. For cancer survivors or individuals facing the diagnosis of cancer, the location of bone metastasis is also a consideration as a potential fracture site. Hip fractures are very common. Usually, if somebody gets a hip fracture, they get a lot of attention and our medical system is setup to put them on the fast track to rehabilitation and trains them to be mindful of their bones. Unfortunately most spinal compression fractures occur silently without people knowing that it happened. Sometimes people have pain. However, 50% don’t have pain. They might have little back ache. But the problem is but then you’re still at a high risk for a second and third compression fracture. Which is why over five years, multiple spinal compression fractures increase your incidents of death and decrease your longevity. Learn not to bend at your spine where you’ll be compressing bone that’s already potentially weakened. Instead bend from the hip, from the knee, and keep your spine in good alignment. This is so very important throughout your activities of daily living. Bone as a living tissue. It requires mechanical stimulation to remain healthy. Your bones need you to stay active. Bone cells are responsive to mechanical signals. When a load or stress is applied to bone, bone is deformed. But it should be deformed just enough that it stimulates the bone and not breaks the bone. You should work with a health care professional that is aware of your health status and is able to gradually increase the stresses into your bodies. This will progressively increase the load in a safe manner while at the same time getting you stronger. When we look at how be build skeletal mass over our growing years, we see that the years around puberty, and there’s some interesting research where they look specifically at that, for girls it’s 11 to 13 and boys somewhere around 12 to 14, those are some of the most bone-building years that you’ll ever have in your entire life. Somewhere in the area of 26% of bone accrual happens in those two years and then you just keep building bone as long as you’re eating well and exercising hard through your early 20’s and somewhere around the age of 25 to 30 years of age, men and women reach their peak bone mass. Now, by looking at the graph you think, “Wow, it’s all downhill after that,” but it need not be. With regular exercise that’s specific for bone building, you can reduce the decline of that slope. You can stave off or reduce the amount of bone loss in you latter years. And this can mean the difference of falling and picking yourself up, or falling and fracturing. I want to talk about bone health and osteoporosis. 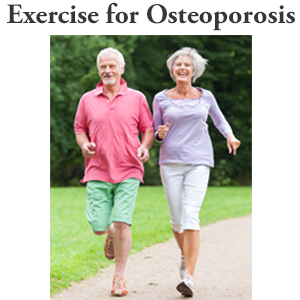 Specifically, five steps you can take to take control of your bone health and osteoporosis. The National Osteoporosis Foundation estimates that approximately one in two women over the age of 50 will fracture a bone because of osteoporosis. If you are a woman over 60, you owe it to yourself to pay attention to your bone health. But how can you improve your bone health and reduce your risk of a fracture? 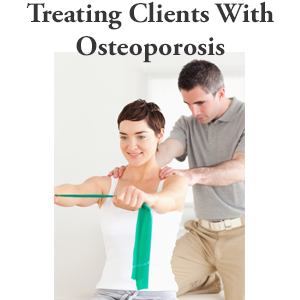 I am a Physical Therapist and I specialize in bone health. 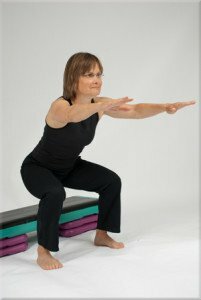 I treat many patients with osteoporosis and low bone density at my clinic in Ottawa, Canada and I also have a popular online service for people who want a safe and effective osteoporosis exercise program. 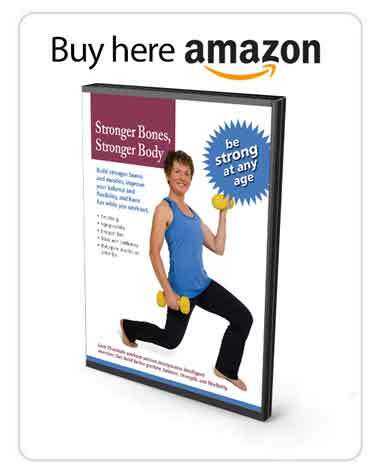 Here are several strategies I use with women who want to strengthen their bones and stay active for many years to come. Posture is more than looking confident and poised. A good posture is the foundation of all movement and is critical to your balance. Unfortunately, many people develop a stooped posture as they age. This leads to labored breathing, fatigue, and poor balance. They become less active and retreat from activities that they enjoy. Their risk of a fall increases because of poor balance. However, these can be avoided by following an exercise program that allows you to maintain and regain your posture by strengthening your back and upper body. I recommend that women exchange low impact activities such as swimming for higher impact, weight bearing activities such as brisk walking, hiking, and step classes. Proper movement and postural alignment play a key role in preventing spinal fractures. I frequently teach women on how to practice mindfulness while they move and help them relearn how they do daily activities such as housework and gardening. Strength training exercises targeted at the upper body improve overall strength and ability to break a fall with the hands. People who have a sedentary lifestyle often start to lose their balance and ability to respond to quick changes of movement in their mid-fifties. Weekly balance and agility drills can reverse these effects. A bone mineral density (BMD) test measures the density of your bones. Physicians often prescribe osteoporosis medications to women with a low BMD test score. 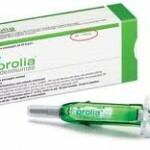 However, many women have reservations about taking the pharmaceutical route. Although osteoporosis medications, such as bisphosphonates and Prolia, increase bone density, there are some serious side effects that you should consider. Pharmaceuticals are appropriate for individuals in urgent need of an increase in bone density but they will not improve your balance or strength, and will certainly not reduce your risk of a fall. While osteoporosis pharmaceuticals do a very good job of building bone density, exercise does a better job of improving bone quality. And as an added benefit, exercise only has positive side effects! Here are several important bone health facts: two new research studies show that the amount of fat and muscle in the body influences bone health – specifically bone strength. In a nutshell, less muscle and more fat are both correlated with bone loss. A higher level of bone loss, in turn, leads to a reduction in bone strength. The good news is that the research also identifies several things you can do to affect your muscle and fat composition to the benefit of your bone health. Specifically, you should look to exercise and vitamin D as key to your success in combating fat, increasing muscle and building stronger bones. The researchers also found other nutrients that can play a key role in muscle formation. The Osteoporotic Fractures in Men Study examines the major causes of osteoporosis. The study determined that male obesity and an increased risk of fracture are related. A separate study, using the data collected in the Osteoporotic Fractures in Men Study, set out to find the effect of belly fat on bone strength. The research team, led by Dr. Miriam Bredella at Harvard Medical School, evaluated 35 obese men. The group had a mean age of 34 and a mean body mass index (BMI) of 36.5. The men were subject to a range of tests to assess fat, muscle mass and bone strength. The researchers used advanced bone strength analysis to predict fracture risk. The study found that men with higher visceral and abdominal fat had weaker bones compared to those with less visceral and abdominal fat. Further, the results of the study indicated that muscle mass was positively correlated with bone strength. Obesity is associated with a range of health issues including cardiovascular disease, diabetes and joint problems. Now, this study provides men (and women) further encouragement to slim down. Not only can exercise play a key role in reducing fat around the middle, research is finding that Vitamin D can as well. Researchers have found a link between low vitamin D levels and obesity – specifically abdominal obesity and visceral fat(1). Other studies are showing that an increase in vitamin D levels may improve your chances of weight loss. Another recent review, this one conducted by the Nutrition Working Group of the International Osteoporosis Foundation (IOF),examined the role of nutrition in sarcopenia (an age associated loss of muscle mass and function). Loss of muscle mass means less muscle strength and this, in turn, leads to an increase the risk of a fall. The review focused specifically on the effects of protein, vitamins D and B and an acid-base diet on muscle mass loss. The Working Group reviewed evidence from worldwide nutritional studies. Protein: Protein plays an important role in bone health. Protein can increase calcium absorption, increase IGF-1 (a compound that stimulates bone deposition) and decrease parathyroid hormone. The IOF Nutrition Group recommends an intake of 1.0 to 1.2 g/kg of body weight per day as ideal for skeletal and bone health in elderly people. The Nutrition Group also points out that you should avoid an excess intake of acid in your diet. A diet that is high in nutrients that produce acids and low in alkalizing nutrients “may have negative effects on musculoskeletal health.” Acid producing foods include grains, meats, cheese, and egg yolks. Alkalizing foods include fruits and vegetables. Your acid producing foods are an important source of nutrients but should be consumed with alkalizing foods. The Group also points out that vitamin B12 plays an important role in improving muscle function and strength.